credited with sounding the alarm upon discovering the Mona Lisa’s theft in 1911.
and dissonant colors of a fauvist style. 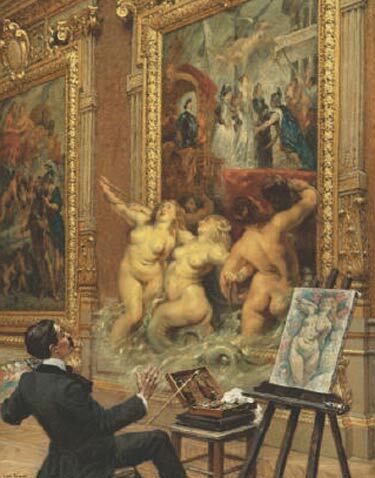 … His careful study is interrupted as the trio of naiads literally flows from the canvas on swirling waves which threaten to soak the gallery and wash him away. The copyist tosses his brush aside as his body is thrown back in shock at the surreal experience. The humor of the composition is further suggested by its title Les joies de l’inondation (The Joys of the Flood) as the rushing waters promise to bring the robust beauties into the artist’s lap. Such levity may also serve to counter a serious situation the artist and his fellow Parisians experienced: in January 1910, the year of the present work’s execution, when the Seine overflowed its banks, bringing quick and catastrophic flooding to Paris. … Water inundated several of the Louvre’s basements, threatening the stored artworks. It was only through the rapidly organized and heroic efforts of Parisians working to build sandbag barricades that further destruction to the museum was prevented — allowing Béroud, his fellow artists, and generations of visitors since to continue to enjoy its many treasures. Alas, though estimated to bring $300,000-500,000, this amusingly surreal painting failed to make its reserve. The Recession, of course. Hat tip to Marius Kaubrys.